There is tremendous competition among European cities in claiming the leading position as a startup hub. The reason for this is, that success usually breeds success and therefore attracts ever more startups to a region. Silicon Valley serves as the blueprint for this. In this context names such as Silicon Roundabout (London), Silicon Alley or Silicon Platz (Berlin), Silicon Wadi (Tel Aviv), Isar Valley (Munich) or Crypto Valley (Zug) have been created. All implicitly claiming ‘We are the Silicon Valley of Europe’. The question is, how do you prove your leading position? The startup world is inherently intransparent and generally lacks statistics, obvious for any young and new market. Thus, measures such as startup revenues, number of startups, number of employees etc. are usually not handy and/or not comparable across cities. But let’s forget about the above for a second. First, the comparison is based on one data point (admittedly, two quarters or six months). As we alluded to above, businesses and industries follow cycles. Capital Markets do and Venture Capital does ASWELL. Therefore, it does not seem right to base a trend or a statement on one single data point. We prefer looking at a full year at least. 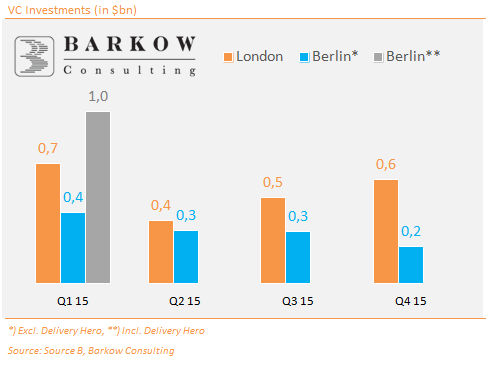 H1 2015 VC spending for Berlin consists of a very strong Q1 and a slower Q2. Q1 was distorted by Rocket Internets purchase of a minority stake in Delivery Hero (>$500m). This was no ordinary funding round and should probably not be included in our view. Another area of distorsion is the possible inclusion of venture debt into venture capital statistics. While venture debt is without doubt a source of startup funding and is therefore positive, it is often not invested, but only committed. It is often used in FinTech space. We prefer to look at equity venture capital. Looking at all FY2015 data excluding venture debt and adjusting for M&A indicates that London venture capital is still ca. 1.75x Berlin. 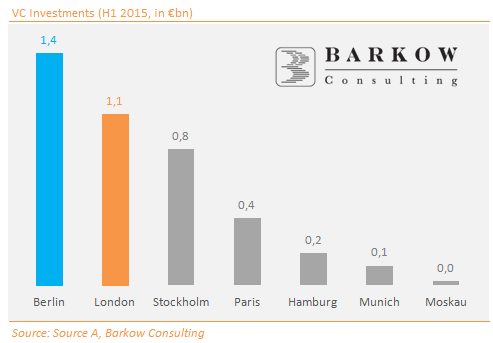 Even if we don’t adjust for M&A, London still takes the lead by around $300m. We are not questioning that Berlin’s startup and VC ecosystem has come a long way, but closing the gap to London still takes additional effort. Let’s all move towards this goal! BTW: Adusting for differences in GDP would give a more favourable picture for Berlin, but we leave that for next time.